After working some more samples of this Breton stitch, the sampler was completed. 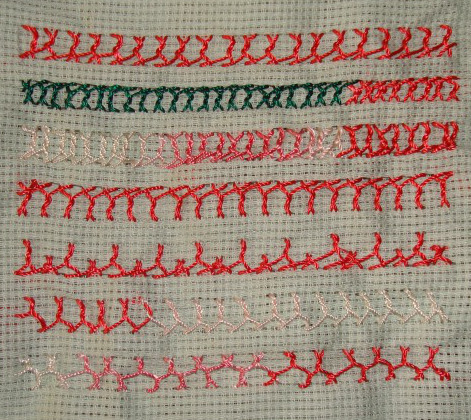 5.The first two rows are variations of Breton stitches worked at 45’ angles . the stitches are worked at different heights in the third row. 6.The Breton stitch is worked with two threads in the first row. I missed this when I was working double Breton stitch earlier. After working a line of Breton stitch, individual breton stitches are worked over alternate peaks in the second row. I like this version of individual Breton stitches and will try some more of them. 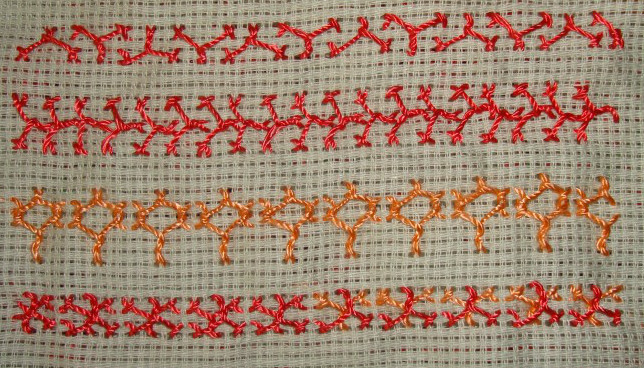 7.Individual Breton stitches are worked alternatively in the first row. Individual Breton stitches are worked vertically one after another in the second row. Two versions of individual Breton stitches are worked one below the other in the third row. The individual Breton stitches are worked one over the other in the last variation. It was necessary to write the details of the last three rows, otherwise at a later date, I would waste time to understand these variations. LOL! 8.After working the Breton stitch as curve in the first row, different stitch combinations are tried in the next three rows. The second row is arrowhead and detached chain stitch combination. 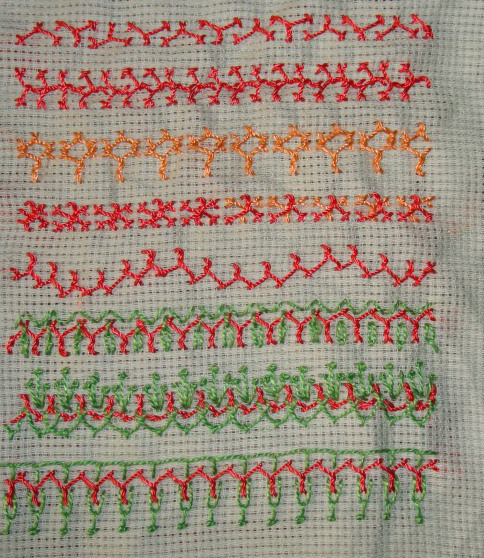 The third row is Pekinese stitch and pistil stitch combination. And the last row is buttonhole stitch and Italian border stitch combination. I could only work for an hour on this sampler today. These variations are with two rows of Breton stitch worked together. Breton stitch is worked with two threads in the first row. Two ways of working double Breton stitch variations were tried in the next rows. 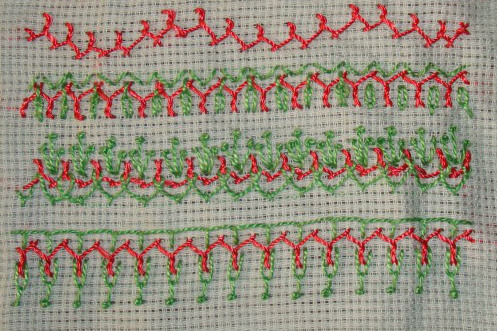 After a week’s break on the TAST 2013 challenge by SharonB on her blog, this week’s stitch is Breton stitch. 2.Here are two versions of open and closed Breton stitch. 3.The first row is open Breton stitch [not clear with the shaded thread] . in the second row, I tried twisting the on both sides, this could be a Cretan and herringbone variation,LOL!